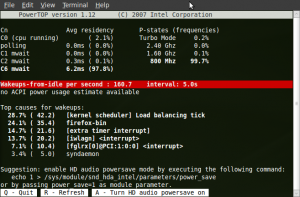 Recently I decided to try out PowerTOP, a Linux power saving application built by Intel. I am extremely impressed by how easy it was to use and the power savings I am now basking in. 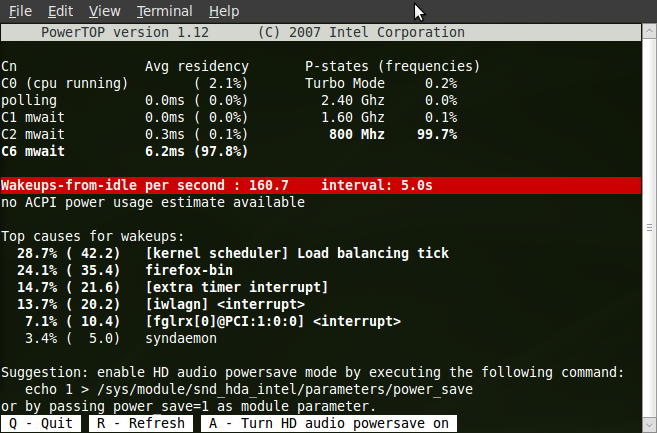 PowerTOP is a terminal application that first scans your computer for a number of things during a set interval. It then reports back which processes are taking up the most power and offers you some options to improve your battery life. All of these options can literally be enabled at a press of a button. It’s sort of like an experience I once had with Clippy in Microsoft Word; “it seems you are trying to save power, let me help you…” After applying a few of the suggestions the estimated battery life on my laptop went from about 3 and a half hours to almost 5 hours. In short, I would highly recommend everyone at least try out PowerTOP. I’m not promising miracles but at the very least it should help you out some. I ran powertop on my machine tonight. While I didn’t do a structured experiment (I should have full charged the battery, checked the estimated lifetime, run powertop, and then checked the estimated lifetime again), I can say that it gave me three or four really obvious fixes that ought to improve my battery life in the long term. I would highly recommend this program to anybody concerned about battery life.